This clip, from a Discovery-Channel documentary on Amelia Earhart, contains historic footage of Earhart's last flight. She—and her navigator, Fred Noonan—are seen departing Lae, New Guinea on July 2, 1937. During this segment of her round-the-world effort—the longest of the entire journey—Earhart's red-winged, twin-engine Lockheed Electra 10E disappeared. While studying this last-takeoff footage, a photo analyst recently noted something which could be very significant in solving the mystery of Earhart's disappearance. As she rolled down the Lae runway, something happened to Earhart's plane (which had apparently been missed at the time and not noticed in the ensuing years because the video was unavailable). The analyst believes the incident could have substantially impaired, or eliminated, Earhart's ability to receive radio transmissions. While searching for a tiny speck of hard-to-find land in the Pacific Ocean—called Howland Island—Earhart was sending messages which were received by Itasca, an American Coast Guard vessel. Itasca also sent messages to Earhart, but it appeared to Itasca's crew members that she never heard them. The analysis contained in this video clip may explain why she never responded. Recent analysis of contemporary messages (largely ignored, in 1937, as not credible or unimportant) have led some experts to believe Earhart and Noonan may have safely landed at Nikumaroro, formerly known as Gardner Island (about 300 miles southeast of Howland Island) before their plane was swept away by the sea surrounding the atoll. An expedition—mounted by TIGHAR (The International Group for Historic Aircraft Recovery)—attempted to determine whether more could be learned about one of the 20th century's most-enduring mysteries. After a $2.2 million effort, however, questions remain unanswered and the mystery of Amelia's disappearance remains intact. Follow this link to watch Amelia as she describes her first transatlantic flight. UPDATES: On October 29, 2014, TIGHAR announced that an artifact located on Nikumaroro in 1991 may be part of an aluminum patch which Amelia had installed on her Electra during her round-the-world journey. The installation was done in Miami with the patch replacing a special window on the plane's starboard side. A 1937 photo published by the Miami Herald, of Amelia taxiing after the work was finished, shows the patch in place. TIGHAR's update compares the recovered artifact with other evidence, leading to the conclusion that the object may be part of the plane's wreckage. And ... during July, 2017 ... the History Channel announced a new documentary featuring a photograph maintained at the U.S. National Archives. 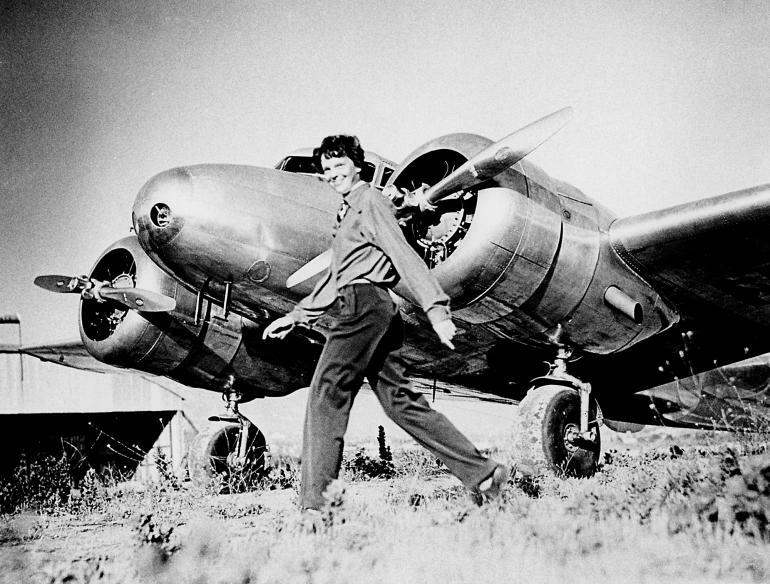 Experts assert that picture may depict Amelia Earhart after her disappearance. EDITOR'S NOTE: Links to the Waitt Institute' web site - "Search for Amelia" - sometimes have internal server issues. We have alerted the site owners about the problem. For now, we have kept the links - for "round the world effort," "red-winged" and "tiny speck of hard-to-find land" - because they are so good. If the problem persists, however, we will deactivate the links. Clip from "Finding Amelia," produced for the Discovery Channel. Copyright, Discovery Communications, LLC., all rights reserved. Clip online, via Discovery Channel via YouTube; provided here as fair use for educational purposes and to acquaint new viewers with the program. Image above, by Angela K. Kepler, depicts an inter-islet channel into the lagoon of Nikumaroro, an atoll in the Pacific Ocean. Some experts believe this speck of land was the place where Amelia Earhart and Fred Noonan may have landed when they could not find Howland Island (during July of 1937). 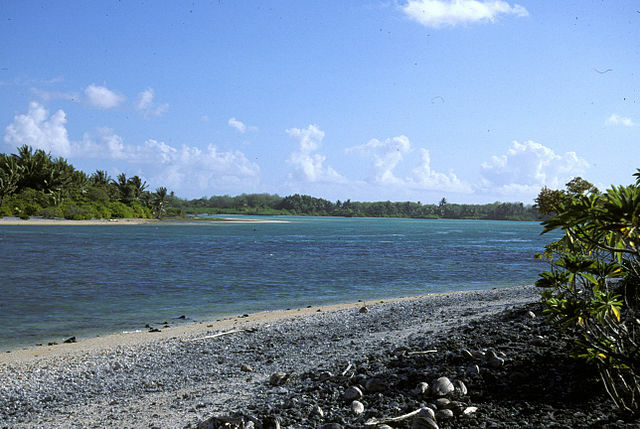 Formerly known as Gardner Island, Nikumaroro today is part of the Phoenix Islands (Republic of Kiribati). 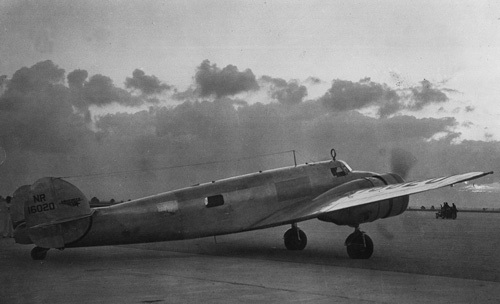 Image of Amelia taxiing in Miami, in 1937, online via the Miami Herald. Bos, Carole "Amelia Earhart - Last Footage Before Disappearance" AwesomeStories.com. Jan 20, 2014. Apr 25, 2019. 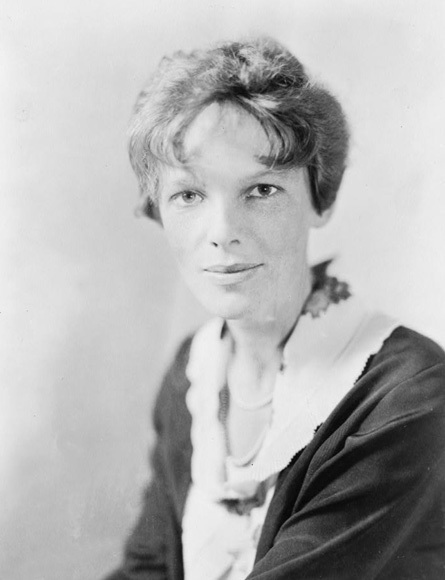 National Archives Photo - Does It Depict Amelia Earhart?